The Werkgruppe Graz, consisting of Eugen Gross, Friedrich Gross-Rannsbach, Herman Pichler, and Werner Hollomey, played a major role in post-war Austrian architecture. All four architects were educated at the Technical University in Graz and began their collaboration in the late 1959, with the first building completed in 1963. The group was an important precursor of what became known as the “Graz School” in Austrian architecture. In addition to their architectural work the group also edited a series of poetry books, to which many of their friends from various circles contributed as authors. Socially progressive, with a participatory as well as scientific approach they realized projects that remain significant milestones until the present day. Their most significant building, the Terrace House Estate in Graz-St. Peter (1965–78) and the Students’ Hostel “Am Hafnerriegel” (1961–64) are both examples of typological, special and social innovations. 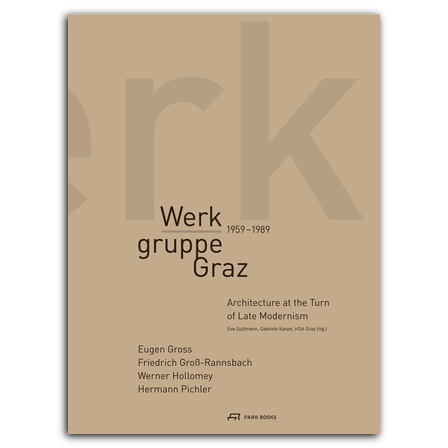 The new book Werkgruppe Graz 1959–1989 is the first comprehensive documentation of the group’s work. A conversation and two essays put them in historical and international context. Some 30 buildings and projects are presented in detail. A complete catalogue of their work rounds out this monograph. It is an important contribution to the examination of the architectural legacy of post-war Austria. is a non-profit organisation for architectural education, founded in 1988. It provides a platform for a variety of events, such as exhibitions, workshops, symposiums on architecture, urban and spatial development.